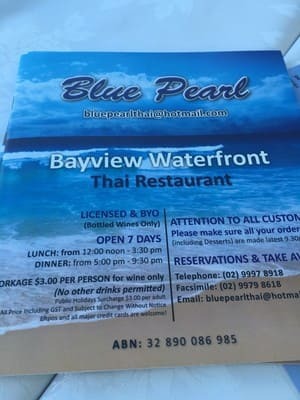 We were known as Green Pearl Bayview Thai Sea-Grill and have since changed the name to the Blue Pearl Bayview Thai Waterfront Restaurant. Our restaurant is one of those precious gems that you find only ever so often, combining great quality food and service with spectacular views, as many of our locals and foreigners alike will attest to. 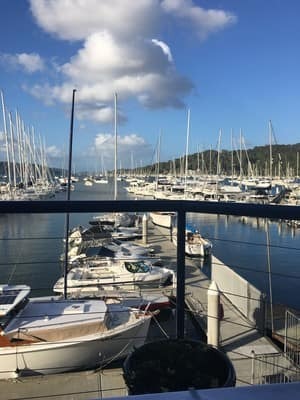 Our restaurant is situated above the Bayview Anchorage (Bakers Marina) overlooking stunning Pittwater, as well as many beautiful and unique boats which moor in this desirable spot along the pontoon. There are often many water activities to watch, and you may even be lucky enough to witness the rising of the moon on the north-east side of the restaurant on a clear summer night. The Blue Pearl Bayview has expanded our service to include pick up and home delivery. Not only do we offer our quality dishes to be delivered to your door, we now will also deliver alcoholic and non-alcoholic drinks with your meal to ensure that your at-home dining experience is as unforgettable as in the restaurant. Click here to learn more about ordering online. 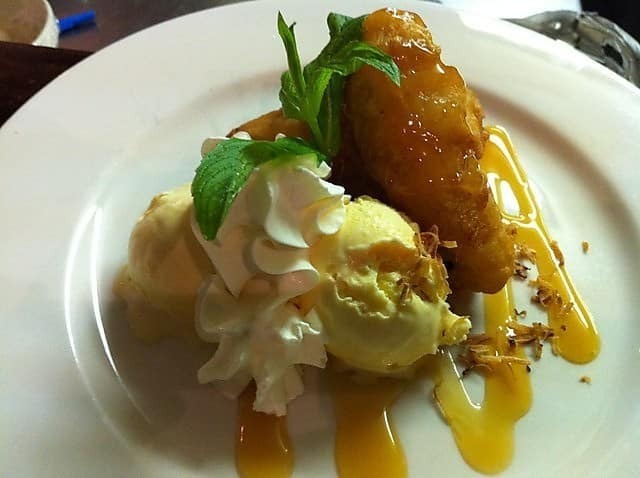 Our restaurant can cater for functions, with a number of events such as Birthdays, Farewells, Weddings, Engagements and Christmas functions often being held in our ample facilities. This year, we have also organised a special charity event on Sundey 25th May 2014 to donate for the medical equipment at Nakhon Nayok Hospital in Thailand. We would like to take the opportunity to thank you our regular customers, from our locals who support us every week to those customers outside Sydney area and overseas, who recommend us to their family and friends. We are so grateful for your support, without it we wouldnâ? ?t be here. We look forward to welcoming you into our restaurant! Come and experience our Thai hospitality soon! All food yum and scenery was great, just service was a little slow oh well... you are too busy ! his place is such a gem! The view is perfect for having good food with the best people. Shame I forgot the name of the food. I like the seafood in sweet glaze with fruit and veggies. The stir fry veggies with cashew is also good! I wish we had more food but we couldn't finish everything. Looking forward to next time. Another breathtaking place I really love. This is one of my favorites. It's always an enjoyable experience. 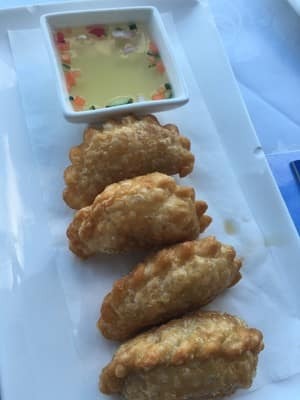 The service and food are always their best. It's an easy favorite for anyone I guess. This place is such a gem! The view is perfect for having good food with the best people. Shame I forgot the name of the food. 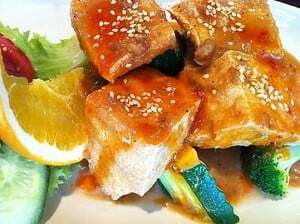 I like the seafood in sweet glaze with fruit and veggies. The stir fry veggies with cashew is also good! I wish we had more food but we couldn't finish everything. Looking forward to next time. So delicious and such a stunning location!!!!! 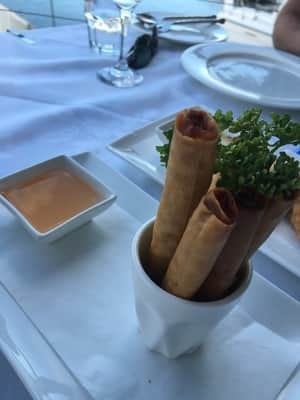 There are plenty of different menu options right down to cigar like spring rolls filled with crab. Our stir fried beef main was simply delicious and we couldn't help but envy the table beside with a whole piece of fish. Cannot wait to go back and try more!! !